I first went to Hawaii on a surf trip to Kauai in the mid 1990's. On that trip I hiked the Na Pali coast and scored my first tropical water, deep barrel ride at a north shore break I dare not mention by name. The trip planted a seed that has flourished in me, and I've been back to every island many times over. On Lifeschool trips, I've guided teenagers to the Big Island where we backpacked throughout Volcano National Park and participated in healing ceremonies with Kahuna elders who have greeted us with nothing but Aloha. In the winter of 2012 - 2013 I moved my family to Maui with the help of a friend, Honolua Bay, Lahaina and the "Upper West" will now always be like home. The memories, dreams and aspirations that have blessed me and my family time and time again will never fade, and they do compel me to do my part to share that Aloha with everyone I meet. 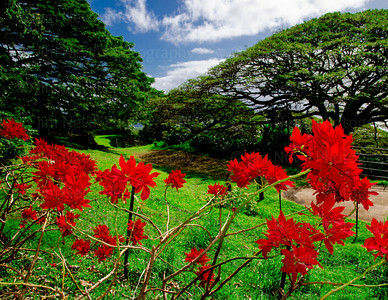 In this gallery are photographs taken on the world more remote islands, Hawaii No Ka Oi! To the surfers eye, the angle this point of land creates (facing south east) just looks like it will be a good surf spot. When the large northwest swells of winter roll through this calm and serene waterfront becomes a world class wave. In the winter of 2012 - 2013 I spent many hours sitting in this Hale, waiting for the paddle out or watching the worlds best pros put on a show. By all stretches of the imagination, this place epitomizes paradise - flat water or big. This photograph was one that I attempted over a dozen times, on a dozen different sunsets. 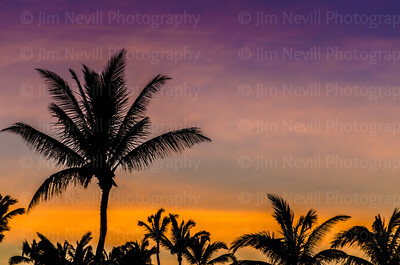 These distinct orange and purple, matched with calm enough winds to not blur the palms for this low light serene moment. It still happens, usually after a big swell when everyone 'got some' already and won't even show up to check when the numbers drop...but see still squeak through unridden. 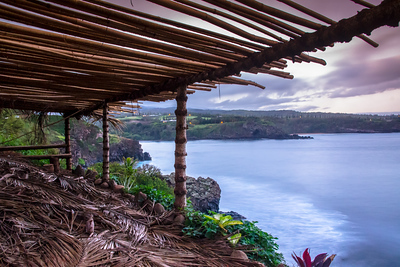 This old thatch roof of the Honolua Hale was taken down and thrown over the cliff to make room for the new palm fronds delivered after the annual "Legends of the Bay" surf competition, which Granger Larson won in 2012. Kapalua's Plantation Golf Course is seen waking up on the hillside in the distance. 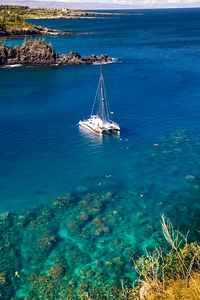 Sailboat anchored up for a snorkel in pristine waters over ancient reef...miles after mile of clear open oceans. 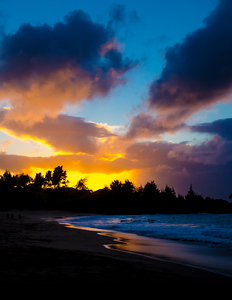 Maui, Hawaii. At the foot of a very steep ravine hidden behind a barrier reef lies this calm uber-blue, yet unaccessable pool. The dark purple accents are most likely ancient coral masts. On Maui, you have to just draw the line and stop shooting because the possibilities are endless, and opportunities are everywhere. 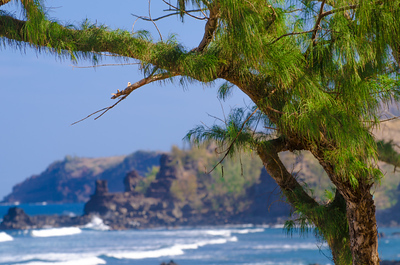 I created this shot of a secret beach, masked by the Bokeh effect by shooting the wispy pine tree at close range with a 150mm telephoto, flash lit foreground for color, sunlit background for distance. Hawai'i is all about what is around the next corner, but so incredible standing right where you are. Haleakalā National Park" - As you exit the Garden of Eden(Hana), you enter a more Big Island looking sea scape, wind ripped, new lava flows and young black sands beaches. Despite the elements the greenery holds fast. There are so many meaningful layers to this photo. Rawness, loss, beauty, infinity, religion, barb wire barricade, and love. Nothing better than watching the sun set over the island of Lanai with your daughter, a cold beer and a friend. 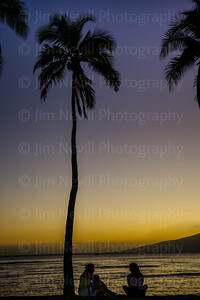 This photograph was shot after sunset near Ka'anapali on Maui, looking out toward the outer island of Lanai. 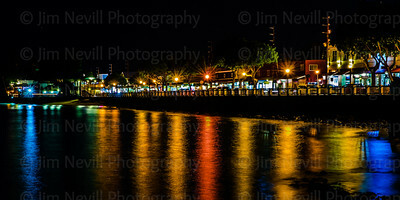 I used a combination of colored flash gels to warm the foreground which made this scene so inviting. DT Flemming's Beach Park, Upper West Maui, Hawaii. 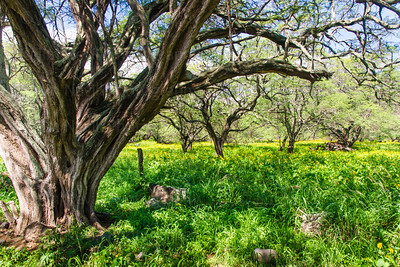 This area of Haleakala National Park is among the lesson known, and lesser visited parts of the Island Of Maui. It is found on the far southern shores, in between the famous volcanic crater and the 7 Sacred Pools of O'heo. Nearby is a place called Kipahulu. 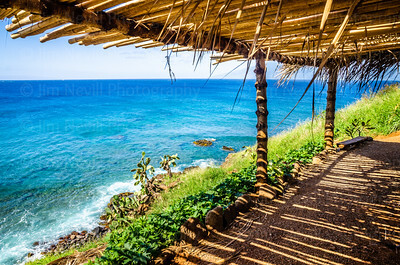 Long before the first Europeans arrived on Maui, Kipahulu was prized by the Hawaiian ali'i (royalty) for its fertile 'aina (land) and kai (ocean). 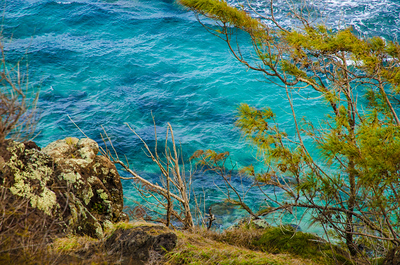 Thousands of people once lived a sustainable lifestyle in this area farming, fishing, and surviving with the resources of the 'Ahupua'a (traditional Native Hawaiian land division which stretches from the mountain to the sea). This area is a Biological Reserve and is closed to the public to preserve the native plant and animal species. 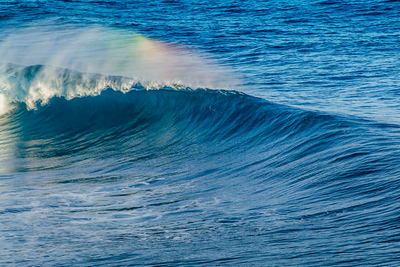 This photo was taken on Christmas Day 2012 and a medium resolution version was uploaded to Surfline.com on December 4, 2014. Within a few days it became the most viewed photo on the entire website, with over 55K views in only a few days time. 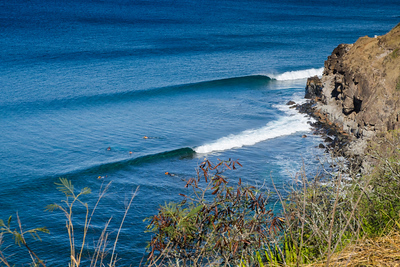 You're right, it's not very likely that when the conditions are this absolutely perfect at Honolua, that no one would be on this wave. There is someone on the wave, but you can't see him because he's throated in the barrel. 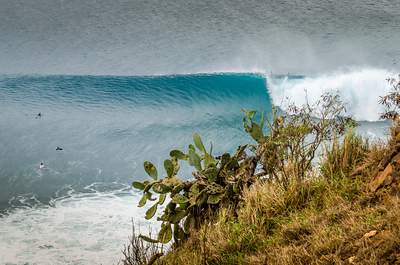 When this photo is blown up you can see the tip of his board about to emerge. For all intensive mind surfing purposes, it's your wave - charge it! We've all heard of 'the drive to Hana'. 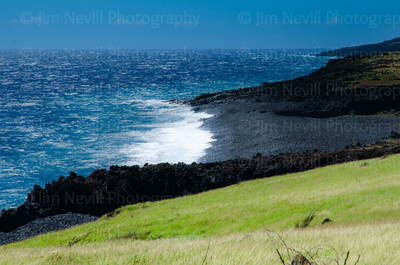 The drive from Hana, towards Haleakalā National Park is just as spectacular. 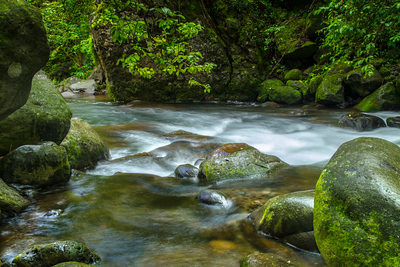 Iao Valley is a phenomenally beautiful and remote state preserve near Wailuku, Maui, Hawaii. It's the location of a fresh drinking spring, hiking trails and pavilions open to the public. 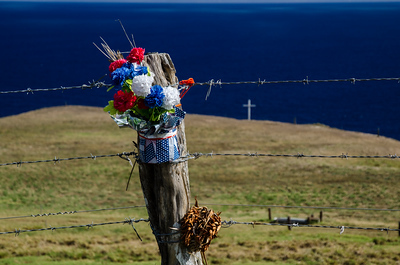 It was also the location of the Battle of Kepaniwai which resulted in a massive loss of life during Maui's final stand against King Kamehameha's effort to unite all of the Hawaiian Islands under his rule in the 1790's. 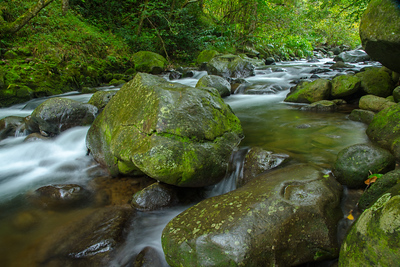 Local lore tells that this Iao Valley Creek was dammed with bodies and ran red for weeks following the battle. Now clear, tranquil, plush and green this site remembers in solidarity the struggles of the past yet sets a beautiful course for the future. 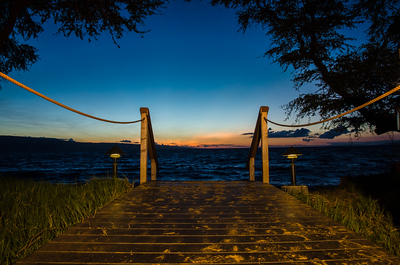 This dynamic photo of a sunset behind the Island of Lanai, a Maui outer island in Hawaii was such a striking moment. It looked almost 3D when I shot it in part because I used an asymmetrical lens. 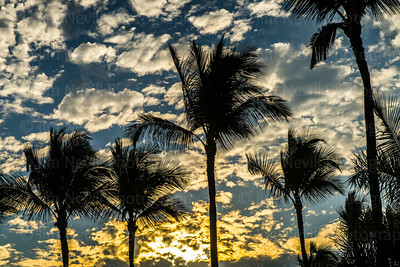 It was actually metered at 45mm although you'd think it was more like 16mm due to the fish eye effect the cloud structures combined with the palm trees created. On Kaho'olawe there are some unknown breaks that happen once a year. This is one, going off, no one in sight. This is a 2:1 panoramic of major portion of Front Street, named among America's best walking streets. The shops in view stretch a quarter mile, from Billabong / Lahaina Store to Bubba Gump Shrimp. The Pioneer Inn is the oldest, longest-consecutive running hotel in the Hawaiian islands. Front Street, Lahaina, Maui. 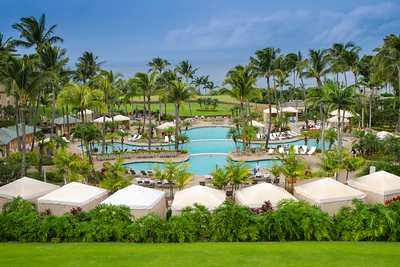 The view from the upper lanai at the Ritz Carlton, Kapalua, Maui, Hawaii. Iao Valley State Park, Wailuku, Hawaii. I set up my tripod in this creek and shot downstream. The colors and textures of the waterway's future, rather than it's past took on a unique texture. Makes for a nice reminder about being hopeful of what's to come.